In the 2nd grade or 3rd grade the private school I attended administered the CTP (Comprehensive Testing Program), or as my peers and I nicknamed it the Child Torture Program. I always seemed to score very poorly on these tests year after year but the teachers were unsure why since I was a bright child who seemed to be succeeding in school otherwise. I was always very talkative in class, often times I would get so excited that I would interrupt the teacher or my peers even though it was unintentional. And on unit tests in various subjects I seemed to do well, although I always had to work harder at math. It turns out the reason that these tests were so unreflective of what I knew was that even if I knew the correct answer, I would struggle to mark the right letter bubble when transferring to the scantron sheet. The bubbles are so small and no matter how hard I tried the scantron would always confuse my brain since it just does not seem to work that way. I was not diagnosed with Nonverbal Learning Disorder (NVLD) until the seventh grade. 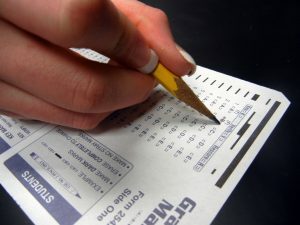 After I was diagnosed, I was able to get accommodations allowing me to mark my test answers on the test directly rather than using a scantron or at least I’d get a special answer sheet. From then on standardized tests were made much easier and they started to actually reflect if I knew the material or not. When I took the written test for driver’s education though they forced me to use the scantron for simplicity and grading purposes. I passed the test by the skin of my teeth, literally if I had missed one more I would’ve failed. Somehow, I was able to succeed on the ACT with the help of my accommodations. Even now as a student at Skidmore College I will not use a scantron because it will only hinder my experience. Even with some success in terms of standardized testing with accommodations I do believe that these tests only reflect a certain kind of intelligence, in many ways they do not prove anything. Colleges and schools in general need to start looking at students and their progress in all subjects more holistically. My name is Samantha Berger and I am currently a student at Skidmore College. I was diagnosed with Nonverbal Learning Disorder (NVLD) in the seventh grade. This diagnosis is only part of my story and I am learning that it does not have to define me. I am learning to fully accept myself and NVLD as just part of my identity.